A new set, a new banlist update, and there are no changes this time. But should there have been? One of the biggest complaints I’ve seen recently is about Sylvan Primordial. To be perfectly honest, I have no experience playing with or against it, but from reading the complaints about it, I think I can accurately comment on it. 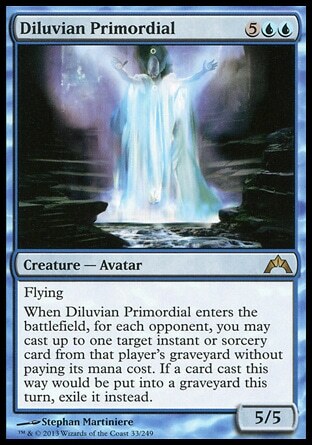 Sylvan Primordial is the only one that has an effect that MUST be used. If you want to cast it to take out a threat of someone ahead of you, you also have to take something from everyone else, even if you don’t want to. 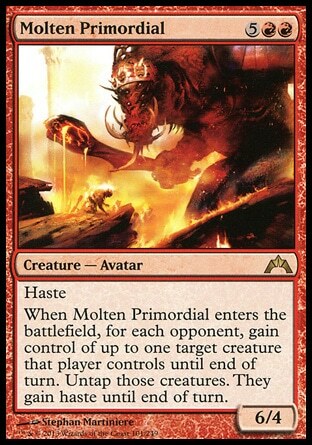 This leaves a bad taste in the “innocent” opponents’ mouths, sometimes the Primordial player as well. 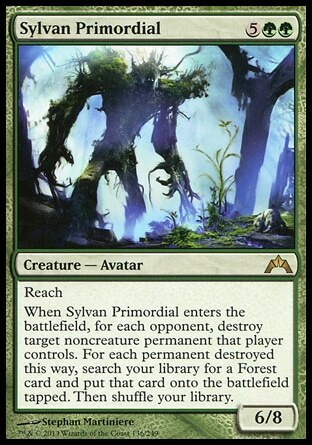 It’s hard to look at Sylvan Primordial without thinking of two similar cards that happen to be banned. “One of the concerns that we’ve had recently is the overrepresentation of heavy ramp strategies, to the point where it makes up a large proportion of the aggregate decks out there. While we think ramp should be good … it’s probably a little too prevalent and needs reining in a bit. 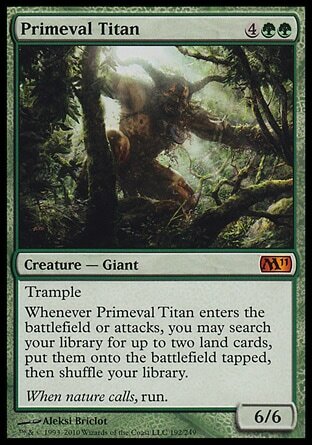 With that in mind, we’re banning the most egregious offender, Primeval Titan. Ubiquity – It has essentially become Primeval Titan’s replacement in green decks. [negative] effect on games/overwhelmingly creates a negative experience – Not only is it multi-LD on a stick, but it also ramps; if this isn’t unfun, I don’t know what is. Abusable intentionally – Reanimation, ramp, flicker… Pretty much anything that could do to abuse the other Titan’s triggers can also abuse this… Except attacking, but who attacks? Unentiontionally game-warping – Other permanents? What other permanents? All of these reanimated primordial clones killed them all. Fair amount of community distaste/listening to the community – Just at a glance, over on the official forums, there is a 7 page thread about banning it and an 18 page one predicting its banning… And that was just going to page two, there are probably complaints about it in the threads that don’t call it out by name too. Sylvan Primordial isn’t a problem for me, but it seems to be for quite a few people. 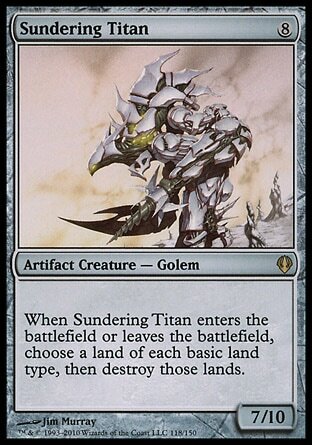 And though I am of the opinion that neither Sundering nor Primeval Titan should be banned, I believe all cards must be evaluated under the same criteria when considering if they warrant banning. 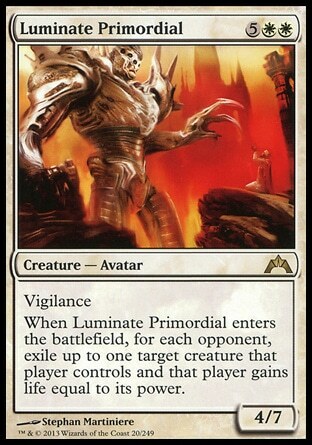 The facts can’t be ignored; Sylvan Primordial matches more than enough of the criteria under which the Titans were banned to be banned itself. 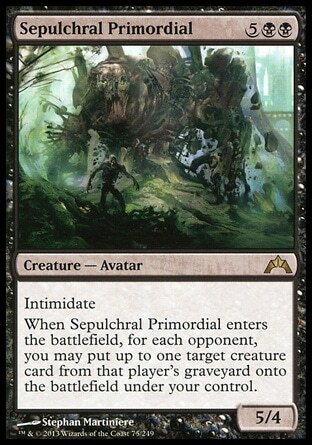 So, what are your opinions on Sylvan Primordial, the titans, and the banlist in general? Next week, I’ll probably be complaining less… But I actually don’t have anything planned… If you have any thoughts on what I should write about, let me know below.